I love stuffed mushroom caps, especially when crab imperial is involved. But if I'm going to spend money on crab meat, I'll use it in something where the crab meat shines. 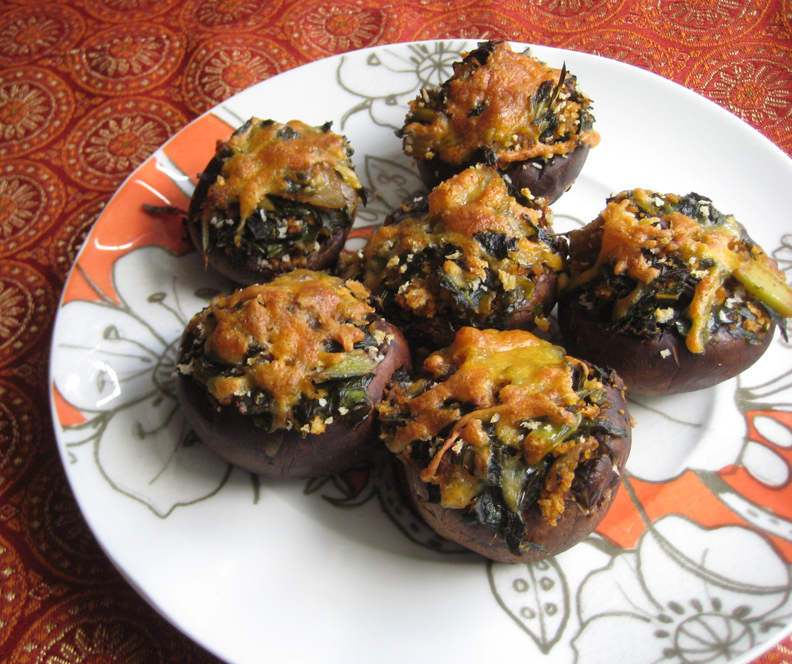 When I found these perfectly-sized-for-stuffing mini portobello mushrooms, I had to come up with a different filling. We had a bag of Trader Joe's chopped kale in the freezer, and I thought "why not?" I also had a package of Mexican chorizo, one of my favorite meat products ever, but if I'm going to go the healthy route with kale, for goodness' sake, why sully it with something fatty like sausage? I know. You don't know me anymore. It's this diet thing I'm on, Mark Bittman's VB6. I'm eating vegetables for breakfast and lunch and not really missing the meat. It's not like I'm deprived - I can eat meat every night for dinner - but I'm finding I am really enjoying the plethora of veg. So yeah, I opted not to put real chorizo in the mushroom caps. Instead, I used chorizo seasoning, which I had purchased a while back and hadn't yet tried. It tastes exactly like Mexican chorizo. Seriously, it does. The seasoning in the recipe is a guideline. You want the kale and onion mixture to be strongly flavored so it will stand out over the bland mushroomyness of the mushrooms, so feel free to add more garlic, spices, or honey to suit your taste. Wipe the mushrooms with a damp cloth to remove any clumps of dirt. Remove the stems. Using a teaspoon scoop out the gills, making the opening of the mushroom as large as possible. In two batches, place the caps on a microwave safe plate and microwave on high for 2 minutes. Set aside. Cook the onion over medium heat in a tablespoon of olive oil and a pinch of salt until softened and starting to lightly brown around the edges. Stir in the garlic. Chop the mushroom stems and add them to the onion along with the kale. Cook until the kale is wilted. Add the chorizo seasoning and honey. If the mixture seems wet, add a couple tablespoons of panko and stir well. Season with salt and pepper to taste. Allow to cool. Fill the mushroom caps with as much of the kale mixture as they can hold. Top each with a sprinkle of panko and a large pinch of shredded cheese. Bake mushrooms for 10-15 minutes, until cheese is melted and bubbly and there are small puddles of moisture under the mushrooms.